Tragedy struck in Umueze community, in the Mbaitoli Local Government Area of Imo State on Wednesday, after the traditional ruler of the community, Eze Opara, allegedly killed a 25-year-old graduate, Uchenna Opara, aka Junior. Punch correspondent, who visited the community in the early hours of Thursday, was informed by residents that the incident occurred on around 6.15pm at the community’s primary school playground. When Punch correspondent visited the palace of the traditional ruler, scores of youths were seen setting the palace ablaze, including destroying the suspect’s Nissan car. An oil mill belonging to the monarch, which was a stone’s throw from the palace, was not spared, as the enraged youths set it ablaze as well. The youth leader of the community, Bethel Iwuoha, told Punch Metro that while one of the security guards of the monarch, Atuonye Opara, allegedly cocked the pump-action rifle, Eze allegedly pulled the trigger. Iwuoha said immediately the bullet hit Junior, a 2017 graduate of Library and Information Science of the Imo State University, Owerri, on the chest, the monarch and his security aide hurriedly entered into a car and fled from the scene. He said Junior was rushed to a police clinic at Amakaohia, where he was confirmed dead. The youth leader accused Eze of always using his security guards to intimidate indigenes of the community. According to Iwuoha, trouble started when the youths, who made use of the playground for their football training, protested that the son of the monarch, Temple Opara, could not take over the field with a football team he brought from Port Harcourt, Rivers State, without informing the youths who had been cleaning the pitch for a long time. He said the prince then gave the youths N10,000, which infuriated the monarch who demanded that the money be handed over to him (Eze). “While we were training on Wednesday evening, the traditiaonal ruler, who was returning in his car with Atuonye, reversed and headed for the pitch. They both alighted from the car and started shouting at us. “The monarch said we were challenging his authority in the community. While he was shouting, his security guard went into the car and brought out the pump-action rifle. “The monarch took the gun and wanted to shoot us, but his personal assistant attempted stopping him. It was in the course of struggling with his PA that a bullet went out and hit Junior on the chest. The traditional ruler, out of fear of attack from the youths, abandoned the gun and fled,” the youth leader said. 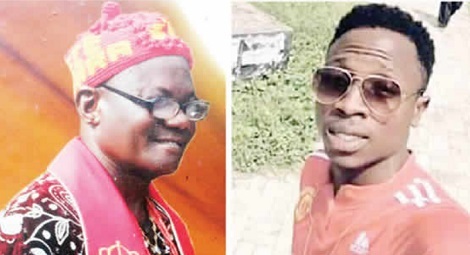 At the family compound of the slain graduate, his father, Franklin Opara, a retired customs officer, said it was the monarch that killed his son. “Junior was supposed to proceed on his National Youth Service Corps programme in March 2017, when he was killed. I was with him a few hours before he went to the field. He was not just my first son, but my first child. I call on the government to give me justice. My son cannot die in vain,” he added. The state Commissioner of Police, Chris Ezike, in a telephone conversion, told Punch correspondent that Eze was in police custody, adding that the gun had also been recovered. He said, “We have moved in to restore normalcy. We are in touch with the community leaders, including the Deputy Governor of the state, Eze Madumere.